Home » Frugal Living » Travel » The Airline Lost Your Luggage. Now What? The absolute worst thing that can happen to you when you arrive at the airport after a long trip is waiting at the luggage carousel and watching it stop as you stand there empty-handed. The airline has lost your bags and you're stranded in a foreign country with no toothbrush, no shampoo, and no clothing. I had the misfortune of living through this catastrophe on a recent trip, and it's not fun. Here's what you can do if it happens to you. In every airport, there will be a luggage lost and found counter. They are usually located right next the baggage carousels and are typically well-marked. As soon as you realize that you made it to your destination but your luggage did not, head to the lost and found area to make a claim. Make sure you bring your baggage ticket as they will need to enter it in the system. They will usually go on the radio and contact the luggage handling staff at the airport to see if your bags were accidentally left somewhere. If you're lucky, your bag is sitting on the tarmac or in the transit area and you'll get it back within an hour or so. If not, you'll have to file a lost luggage claim. The staff will give you a form to fill out with your name, home address, hotel address, passport number, phone number, luggage description, and baggage tag number as well as a brief description of what was in your bag. They will then photocopy your luggage tag, your passport, and the information you gave them and hand you a piece of paper with a reference number. If, after 24 hours or more, you still haven't heard from the airline, go online to the airline's website and click on the "Lost Luggage" section. Enter your reference number and last name and check the status of your claim. Most airlines will update your status as soon as they find your luggage, but sometimes they can be slow and unreliable. Some people have had to go without their bags for months, while others never saw their precious luggage again. Go on the airline's website and look for a customer service number. Call them and navigate the automated telephone menu until you get to a luggage lost and found representative. Give them your reference number and tell them your situation. Ask them to do everything they can to find your bag and also tell them how long you'll be at the hotel. Make your situation sound as dire as possible to try to encourage them to actively search for your bag. Make sure that all of the information that you gave is correct and remains valid. If you check out of your hotel and move to a new one, call or go online and change the information on the claim so that the airline can properly contact you when your bag is found. Even if you move to another city or country, they should courier your bag to you as soon as possible. The US Department of Transportation has laws in place that help to hold the airline responsible for your lost luggage and the contents of your bag. While the airline is technically required to reimburse you for any losses, the individual airline regulations vary greatly. You can, however, be certain that you will be covered for your essentials. Contact the airline and ask them how much essential spending you will be covered for. Then go out and buy yourself some new underwear, shampoo, deodorant, and clothing. Keep all the receipts for these purchases because you will be asked to submit them later. Sometimes the "Maximum Claim Amount" can be found on the back of your luggage ticket. This is the amount that you can spend on essentials and emergencies. For permanently lost luggage, there are different amounts you can be reimbursed. No airline is going to willingly offer you the full reimbursement for your troubles or for the value of your lost items. You will have to negotiate, complain, and protest. Make sure you talk to a supervisor when making your claims and if you had anything of sentimental value in the bag, make sure you tell them. Also request that they refund you your checked baggage fee. The airline shouldn't be paid $25 for losing your luggage! You can also ask to be reimbursed in other ways. You may be able to complain your way into a free flight or at least an upgrade into first class on your next scheduled flight with the airline. Some airlines don't make the claim process very easy. In this situation, you can take to social media and try a good old fashioned smear campaign. Mention the airline and explain your situation on any social media accounts you have and be sure to @ them so that they will see the posts. No company wants to have the story of your lost luggage go viral on social media. You may be able to speed up the claim process or land yourself some free flights by posting about your situation on Facebook, Twitter, and Instagram. According to the DOT's latest Air Travel Consumer Report, 2.9 in 10,000 passengers experience delayed, damaged, or lost baggage. They estimate less than 2% of those passengers actually end up with their luggage permanently lost. If you are one of those unlucky people, it's time to make a lost luggage claim. Claims for reimbursement will have to be backed up by receipts and proof of payment. When you go out shopping for emergency clothing and essentials, make sure to keep all of your receipts and when you claim the items that were permanently lost in your bag, try to find as many receipts as you can to back up your claims of what was in the luggage. 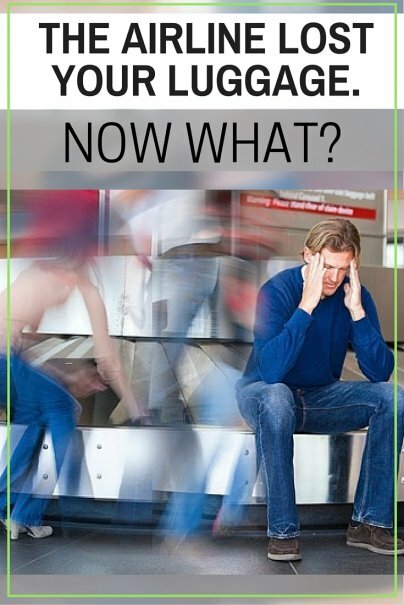 Before 2009 when DOT tightened restrictions on lost luggage claims, you would have had to kiss your luggage goodbye and never be reimbursed more than the cost of your essential emergency spending. Nowadays, the airlines are held responsible for "all reasonable, actual, and verifiable expenses related to baggage loss, damage, or delay." Technically, the per passenger maximum for domestic flights in the U.S. is around $3,400, but getting that amount would be like winning the lost luggage lottery. You're more likely to be refunded a small portion of what you lost. For international flights, you may only be reimbursed around $1,600. It is unlikely that you'll ever receive these full amounts unless you can prove that your bag was indeed carrying more than that value. Even if you can prove that you were carrying $3,400 worth of stuff in your lost baggage, the airline will only pay you a fraction of that amount. They are only required to pay the "depreciated value" of your items, so expect to take a major loss. Some travel insurance policies will cover you for lost baggage. This can help to top up the amount the airline agrees to pay. Contact your travel insurance provider and ask about their lost luggage policy. If you paid for the flight with your credit card, contact the card issuer and ask about baggage insurance. Many credit cards will help to cover you for your losses. Hopefully you didn't have to go through every step in this article and somewhere in this process you were contacted by the airline and informed that they found your bag. If this is the case, you can either return to the airport to pick up the luggage yourself, or have it delivered to the address that you entered on your claim. Some airlines will try to make your pay for the delivery (believe it or not). If this is the case, negotiate and try your best to have them cover the cost. When your bags are safe and sound back home, it might be wise to invest in a GPS luggage tracker in the event this should ever happen again. Has the airline ever lost your luggage? Did you get it back? Be careful. If you get the airline to reimburse your checked luggage fee you may be "terminating your contract" with them. In a court of law they would no longer have to pay you. For what its worth, snap a photo of your bag after its packed or before you check it in. That can also help with identifying it.